In a 2 quart glass, plastic or ceramic container, combine 1 cup flour and 1 cup sugar. Mix thoroughly or flour will lump when milk is added. Add 1 cup flour, 1 cup sugar, and 1 cup milk. Stir with a wooden spoon. Add 1 cup flour, 1 cup sugar and 1 cup milk. Stir. Take out 3 cups and place 1 cup each into three separate plastic containers. Give one cup and a copy of this recipe to three friends. To the balance (a little over one cup) of the batter, add the following ingredients and mix well. Note: When you make a starter from scratch, you can sometimes end up with a much greater yield than 4 cups depending on the temperature of your kitchen and eagerness of your starter! If this happens, reserve one cup for baking and divide the remaining batter into Ziploc baggies of 1 cup each to freeze or share with friends. As long as you continue to “feed” your starter, it can stay at room temperature indefinitely. One of the wonderful things about the starter is that you can bake almost anything with it, pancakes, bread, biscuits. 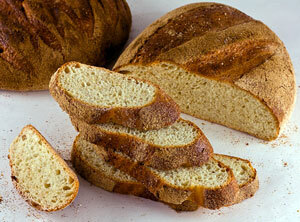 It is a sweet dough, not a sour dough because of the sugar. Just give it a bit of flour every week or so and it will continue to survive and you’ll have a lifetime of yeast. Run out of flour? Then dry some acorns, and ground them up fine to be a flour substitute. Any carbohydrate like flour, rice flour, will work. TheCovertPrepper is the editor of TheCovertPrepper.com, PPRNNews.Wordpress.com, the host of the PPRN News Show podcast, and is a Contributing Columnist for Radical Survivalism Webzine.